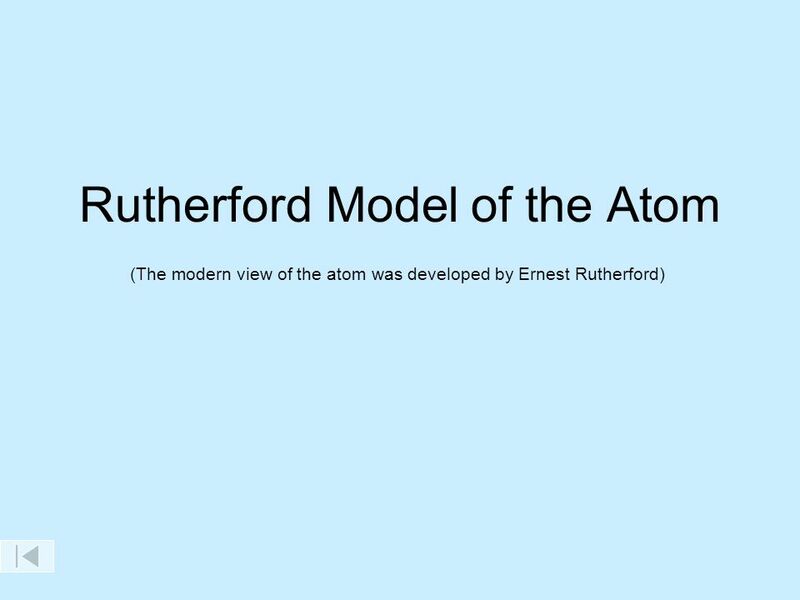 (The modern view of the atom was developed by Ernest Rutherford) Objectives: To describe the Rutherford nuclear model of the atom. 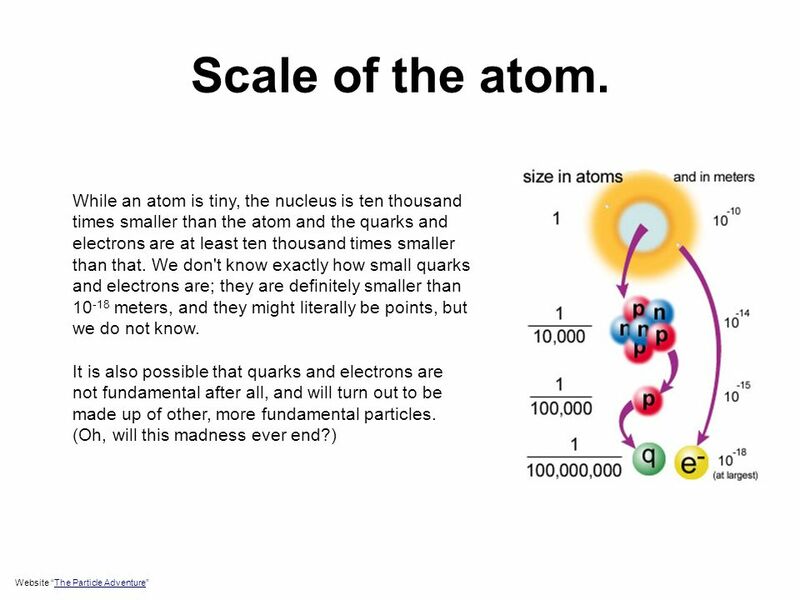 To state the relative charge and approximate mass of the electron, proton, and neutron. 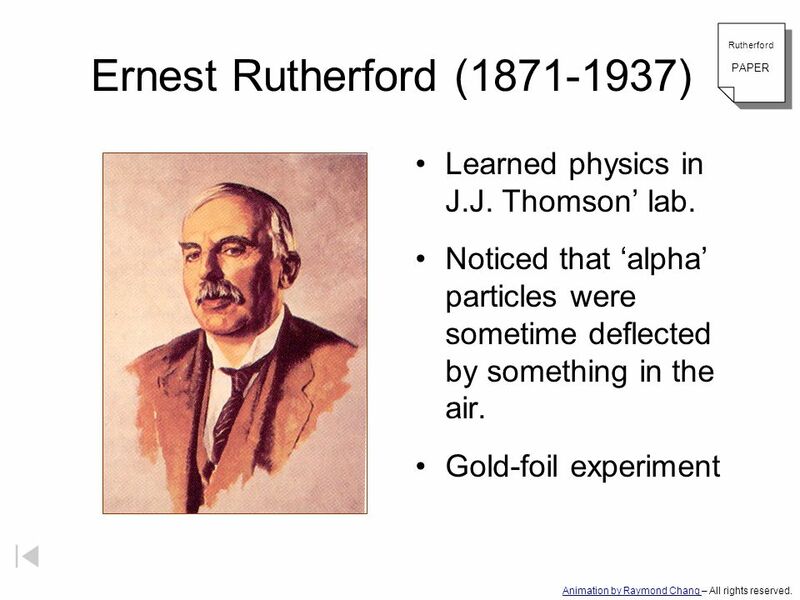 2 Ernest Rutherford (1871-1937) Learned physics in J.J. Thomson’ lab. 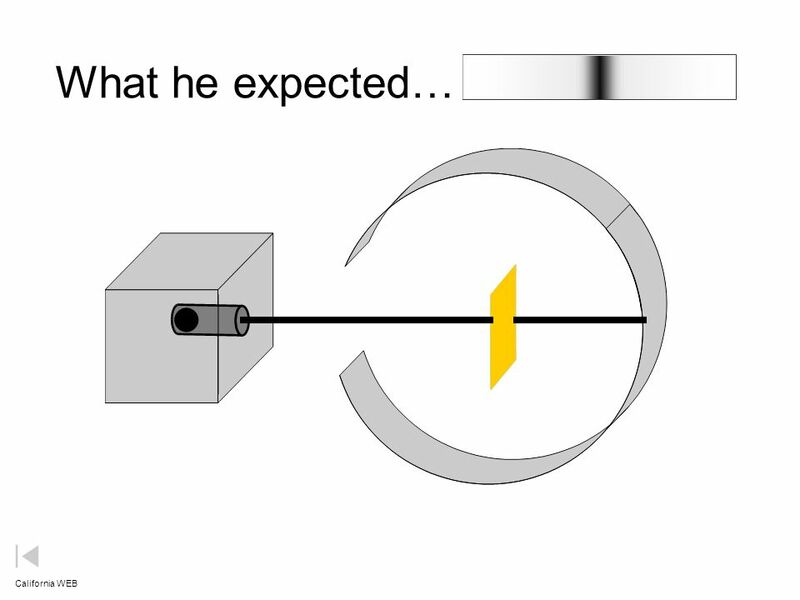 PAPER Learned physics in J.J. Thomson’ lab. 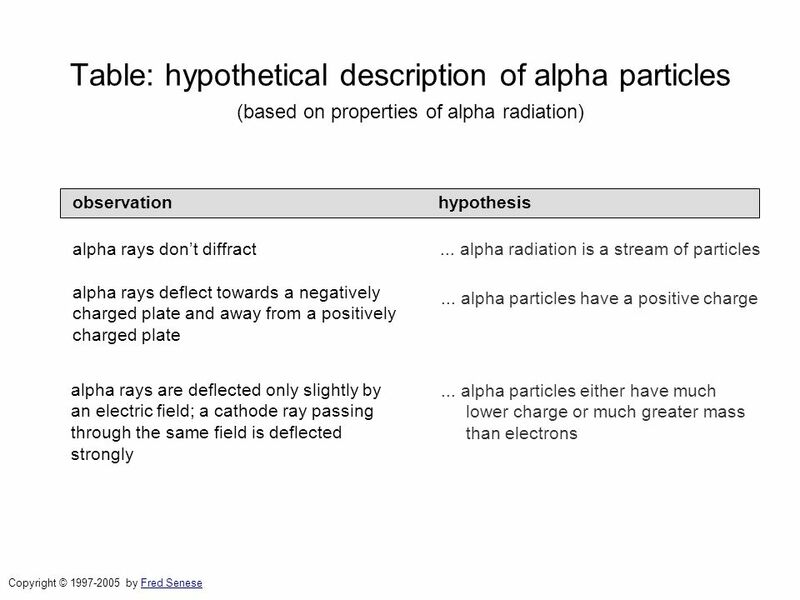 Noticed that ‘alpha’ particles were sometime deflected by something in the air. 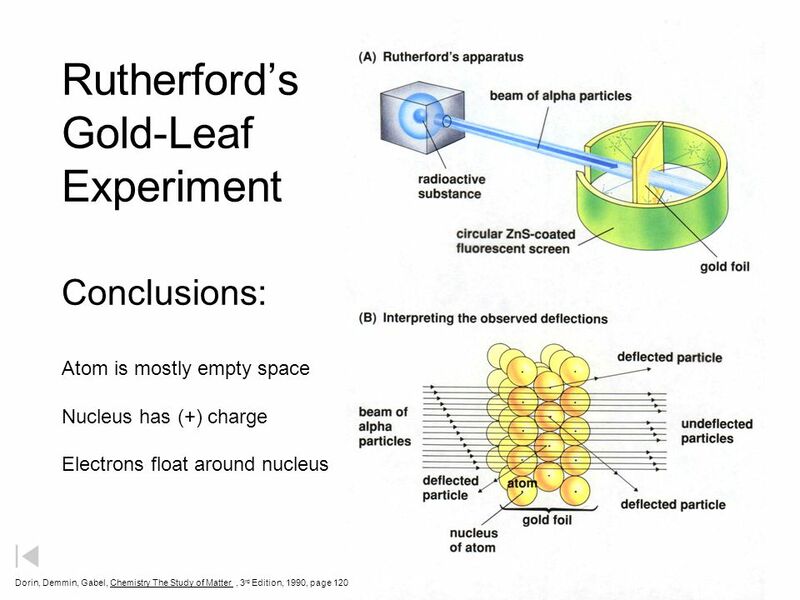 Gold-foil experiment Ernest Rutherford received the Nobel Prize in chemistry (1908) for his work with radioactivity. 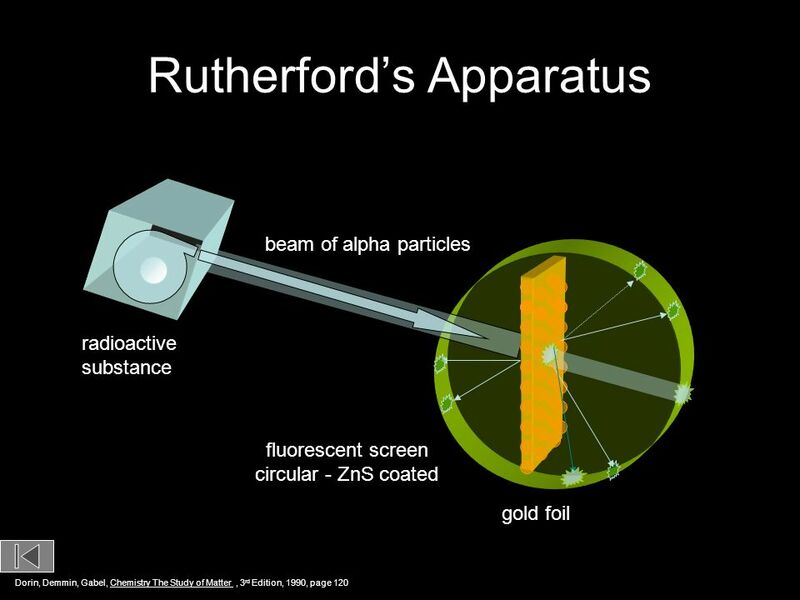 Ernest Rutherford ( ) was born in Nelson, New Zealand in He began work in J.J. Thompson’s laboratory in He later moved to McGill University in Montreal where he became one of the leading figures in the field of radioactivity. From 1907 on he was professor at the University of Manchester where he worked with Geiger and Marsden. 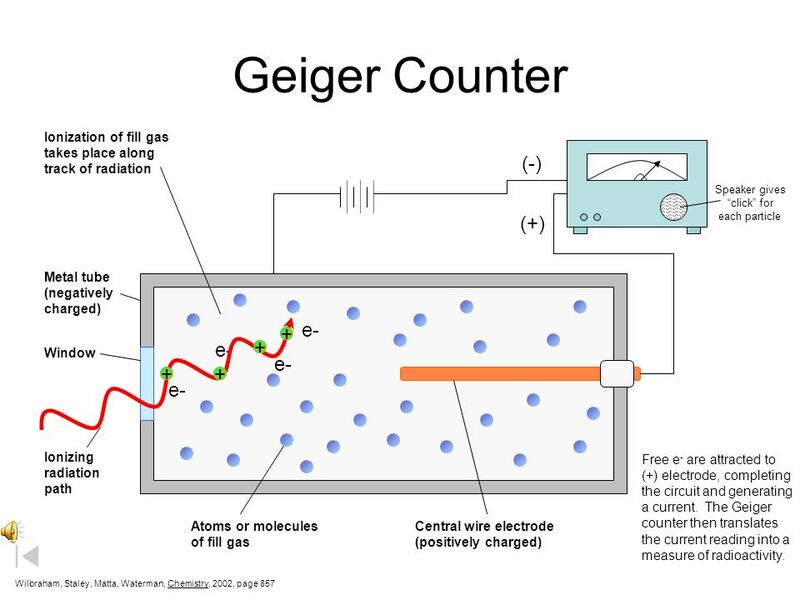 He was awarded the Nobel Prize for Chemistry in 1908 for his work on radioactivity. 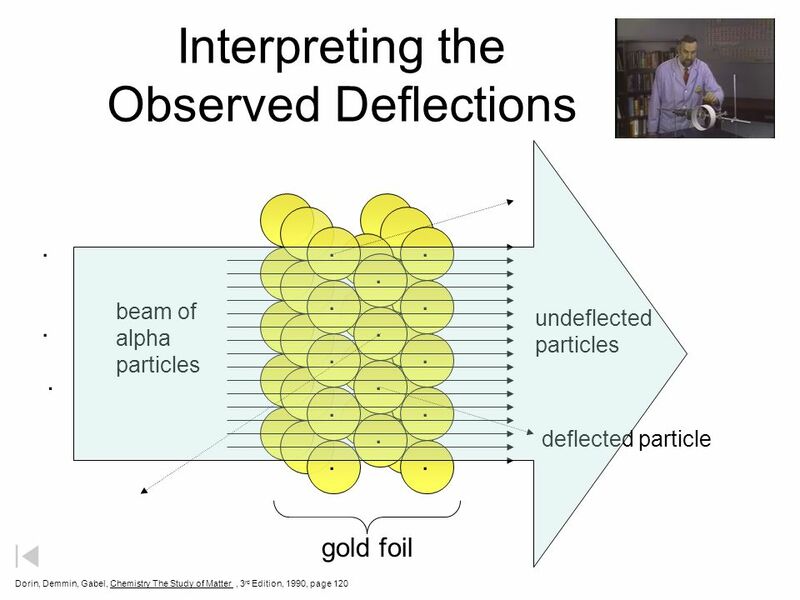 In 1910, with co-workers Geiger and Marsden he discovered that alpha-particles could be deflected by thin metal foil. 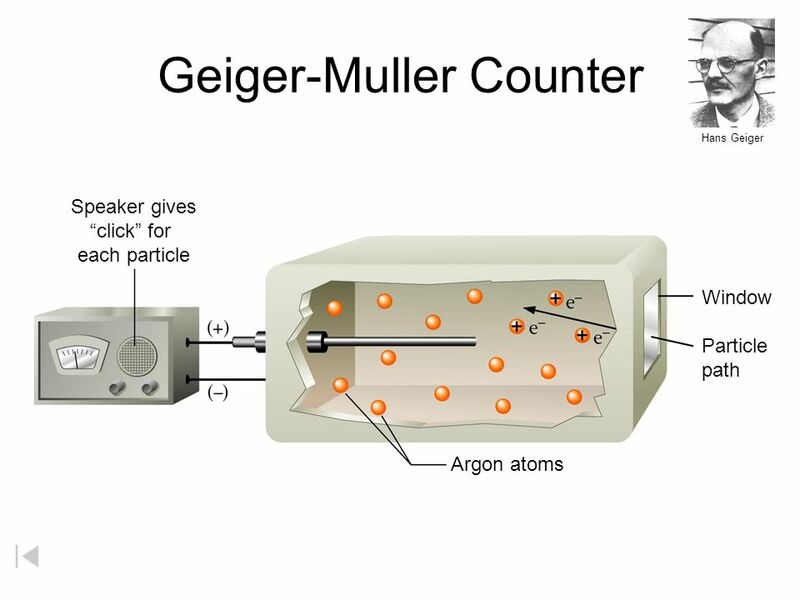 This work enabled him to propose a structure for the atom. Later on he proposed the existence of the proton and predicted the existence of the neutron. He died in 1937 and like J.J. Thompson is buried in Westminster Abbey. He was one of the most distinguished scientists of his century. Is the Nucleus Fundamental? Because it appeared small, solid, and dense, scientists originally thought that the nucleus was fundamental. Later, they discovered that it was made of protons (p+), which are positively charged, and neutrons (n), which have no charge. Animation by Raymond Chang – All rights reserved. 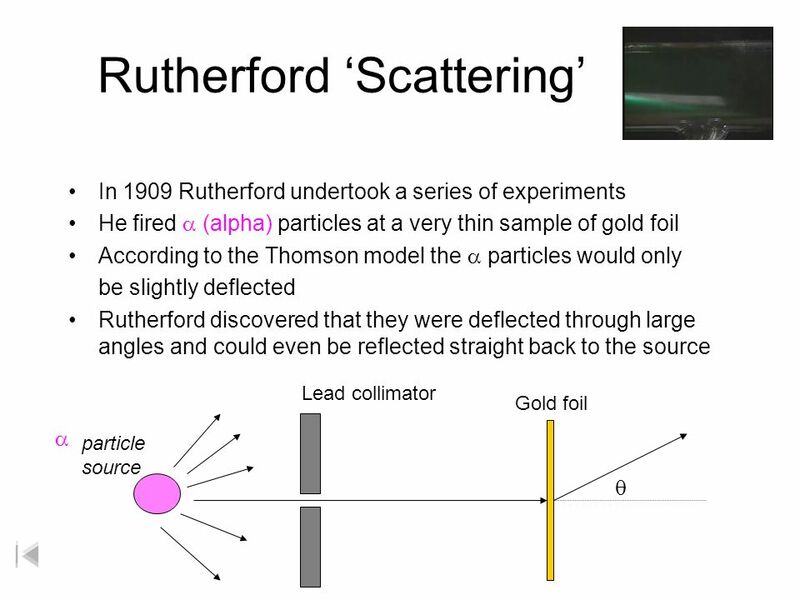 In 1909 Rutherford undertook a series of experiments He fired a (alpha) particles at a very thin sample of gold foil According to the Thomson model the a particles would only be slightly deflected Rutherford discovered that they were deflected through large angles and could even be reflected straight back to the source particle source Lead collimator Gold foil a q Rutherford’s results strongly suggested that both the mass and positive charge are concentrated in a tiny fraction of the volume of the atom, called the nucleus. 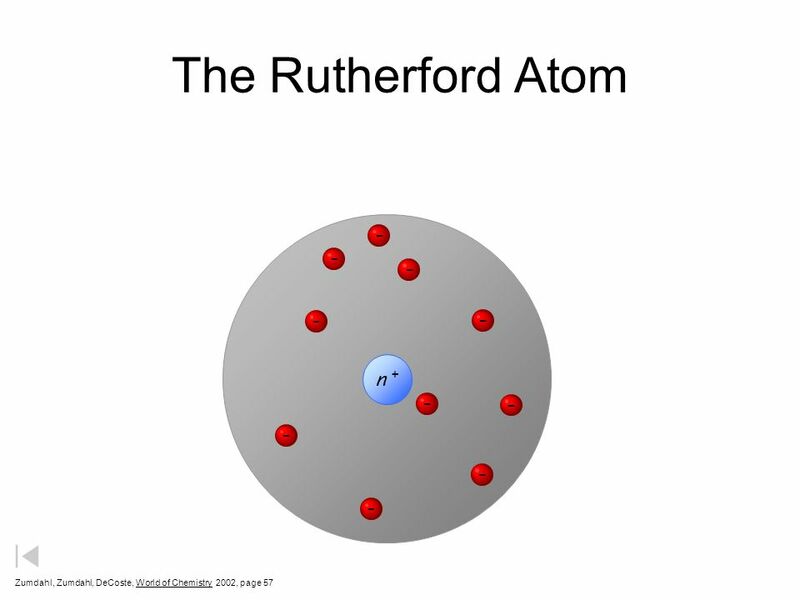 Rutherford established that the nucleus of the hydrogen atom was a positively charged particle, which he called a proton. 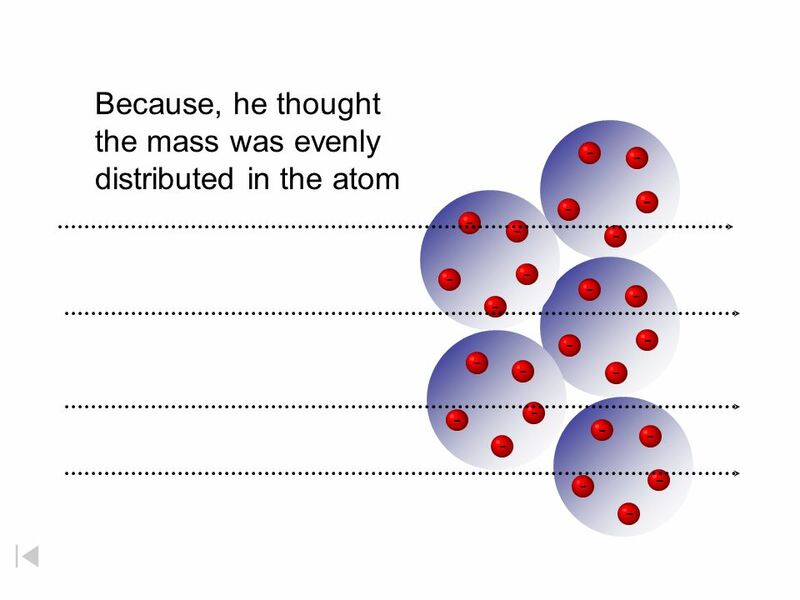 Also suggested that the nuclei of elements other than hydrogen must contain electrically neutral particles with the same mass as the proton. 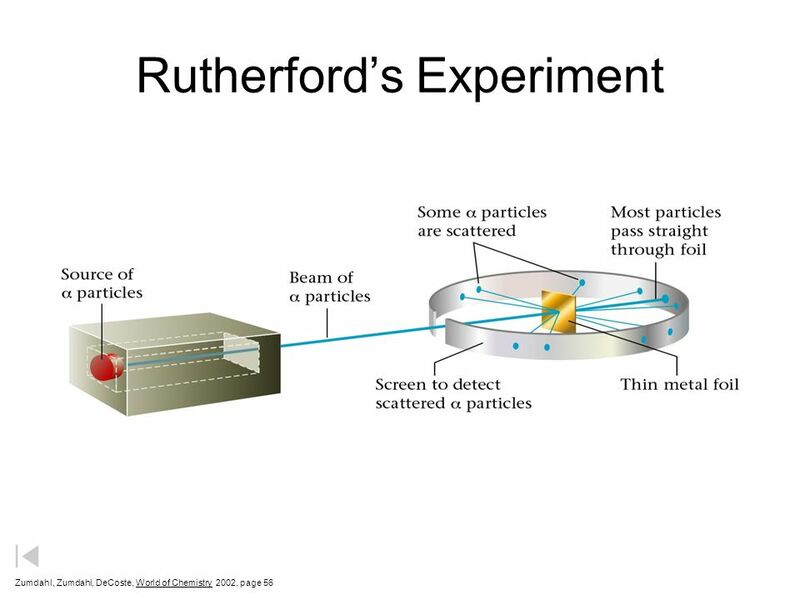 The neutron was discovered in 1932 by Rutherford’s student Chadwick. 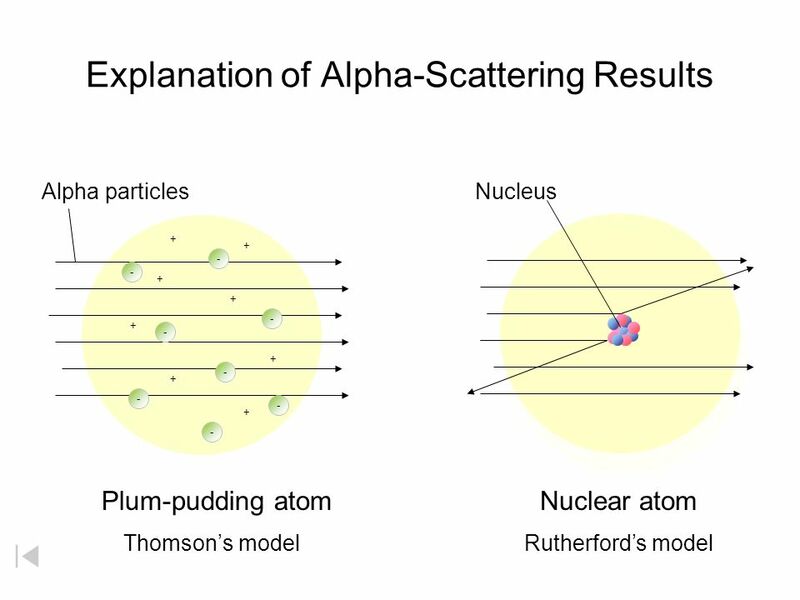 Because of Rutherford’s work, it became clear that an α particle contains two protons and neutrons—the nucleus of a helium atom. 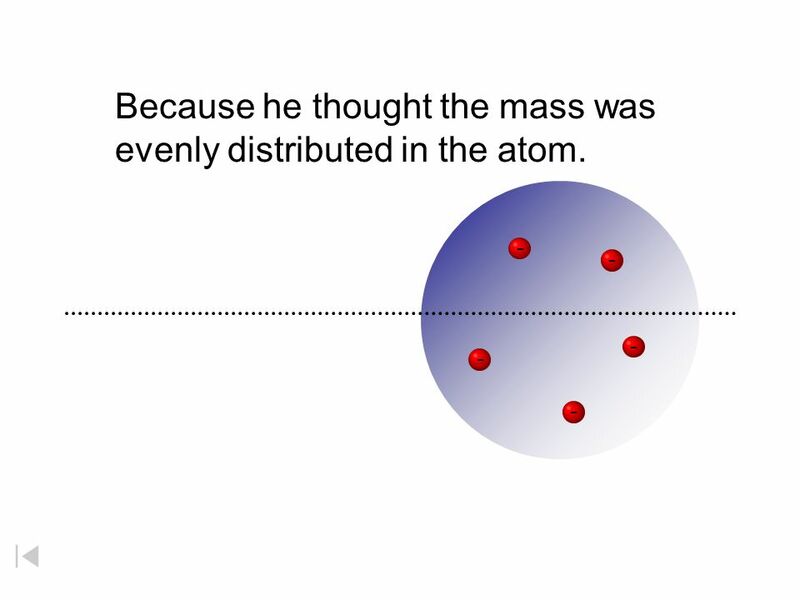 12 he thought the mass was evenly distributed in the atom. 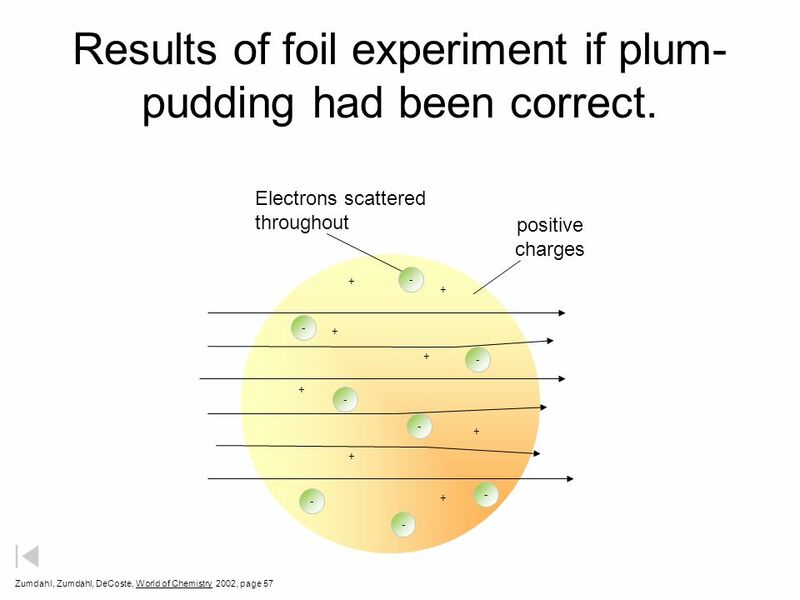 22 Results of foil experiment if plum-pudding had been correct. 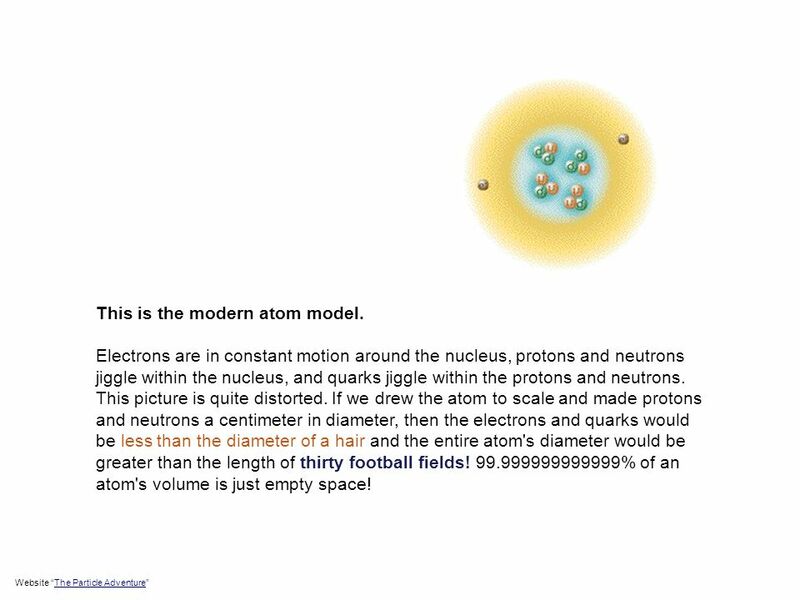 28 This is the modern atom model. 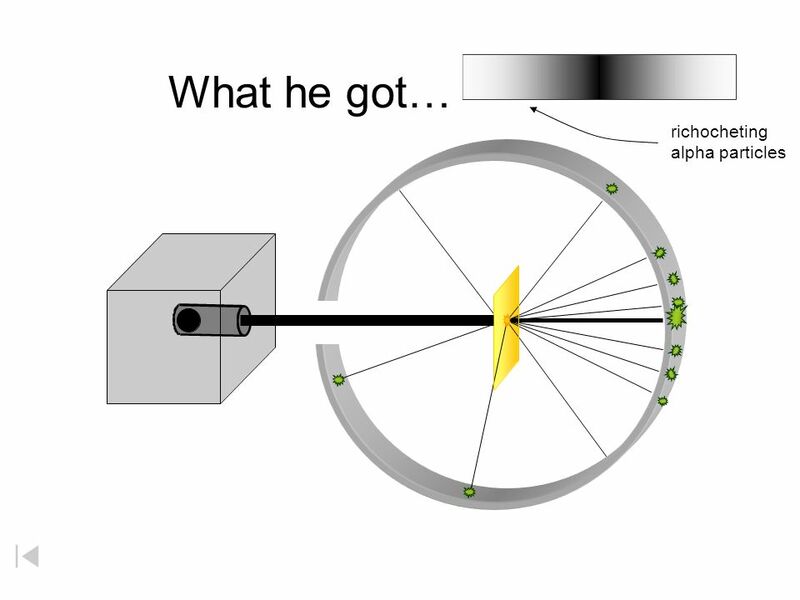 30 6 leptons. 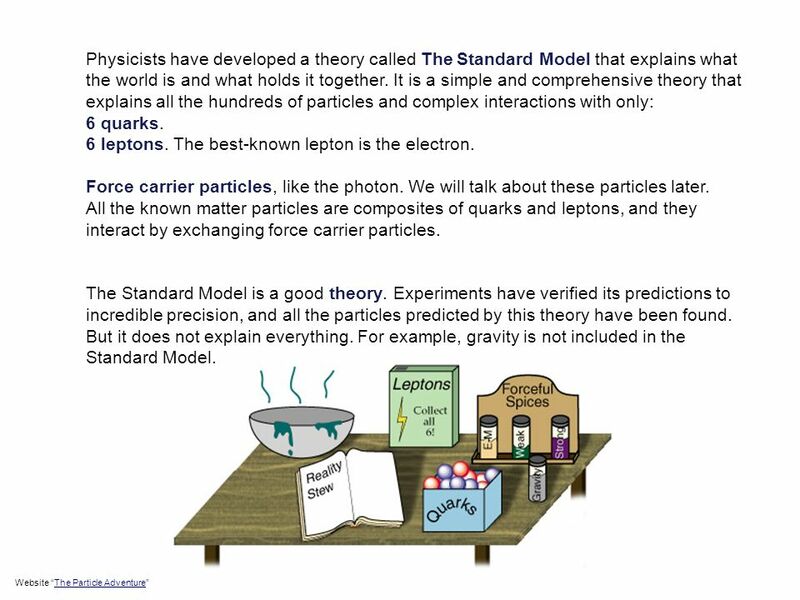 The best-known lepton is the electron. 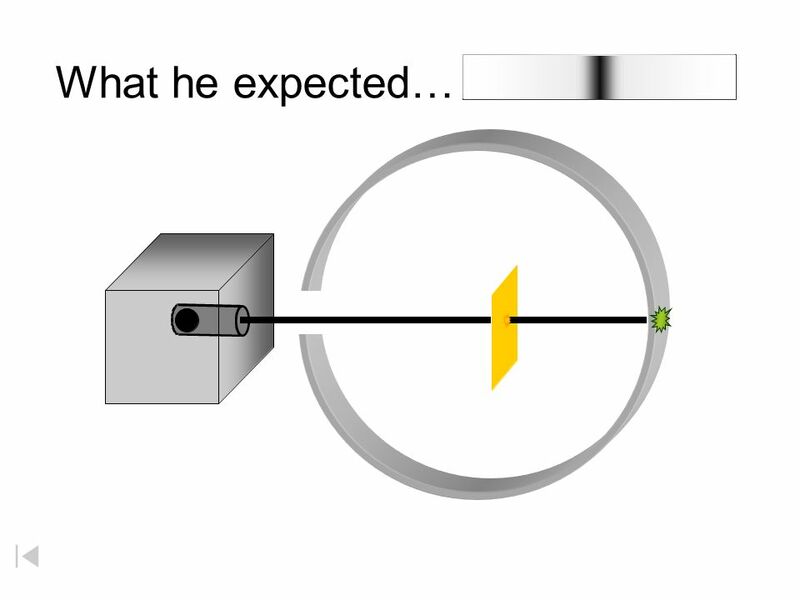 Davy suggested that electrical forces held compound together. 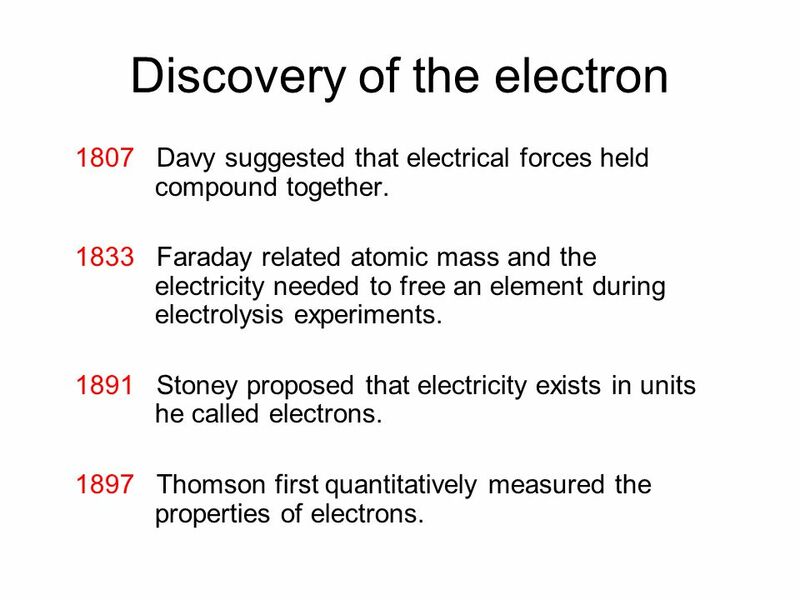 Faraday related atomic mass and the electricity needed to free an element during electrolysis experiments. 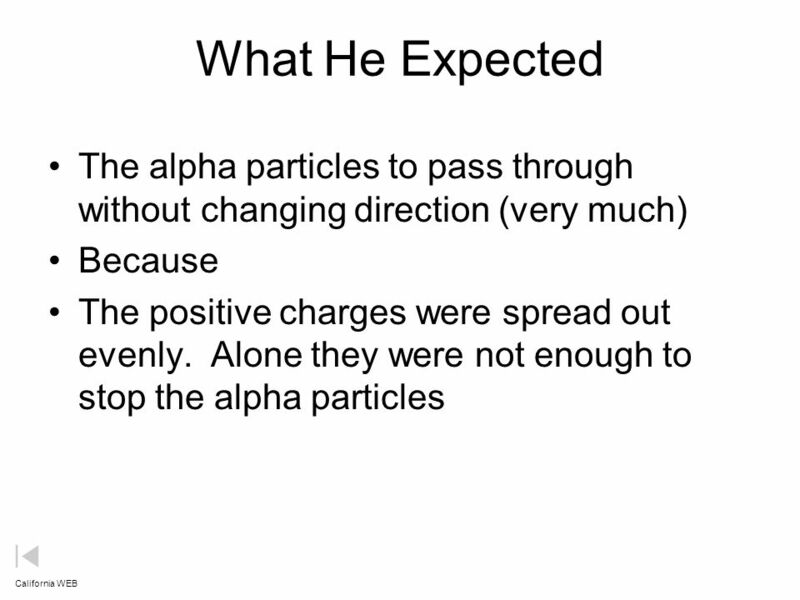 Stoney proposed that electricity exists in units he called electrons. 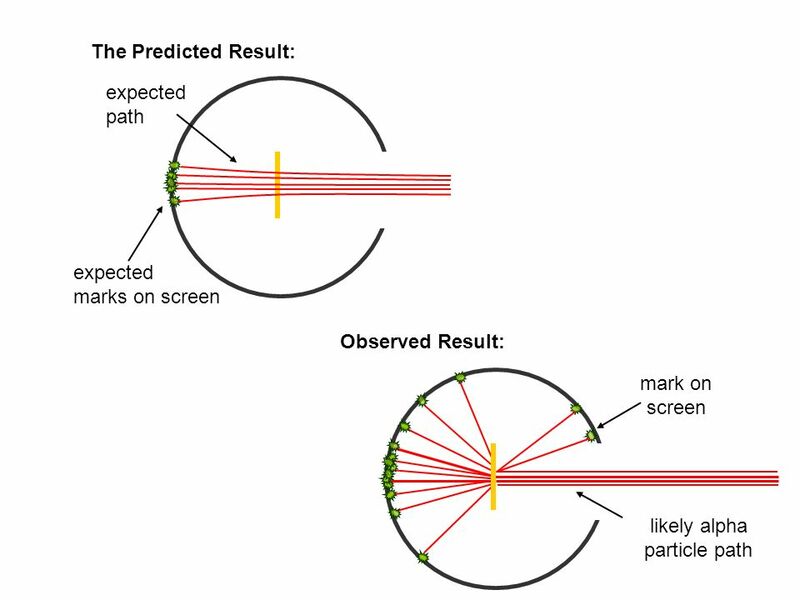 Thomson first quantitatively measured the properties of electrons. 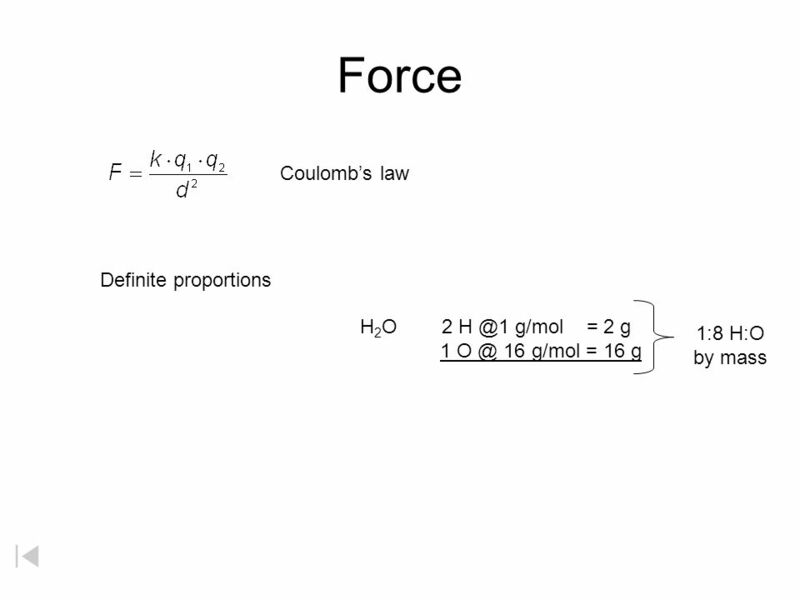 32 Coulomb’s Law Why don’t electrons collide while moving around the outside of atom? 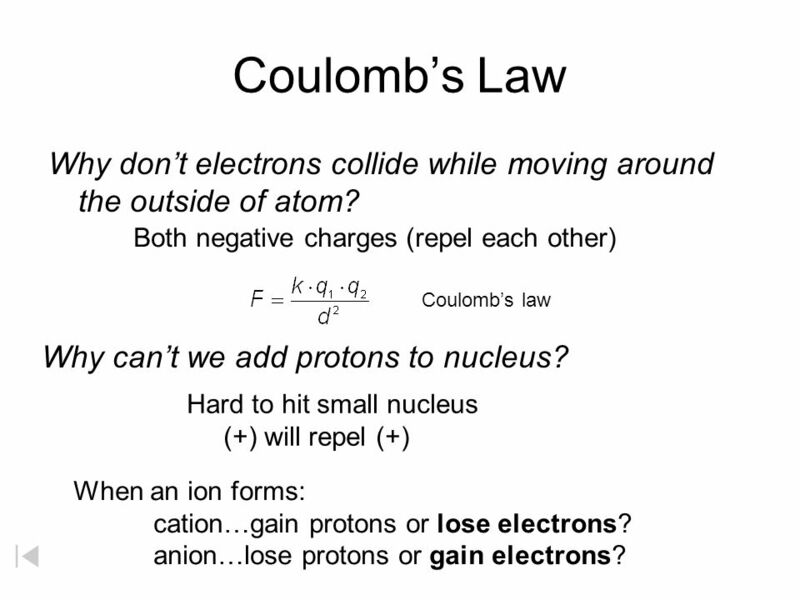 Both negative charges (repel each other) Coulomb’s law Why can’t we add protons to nucleus? 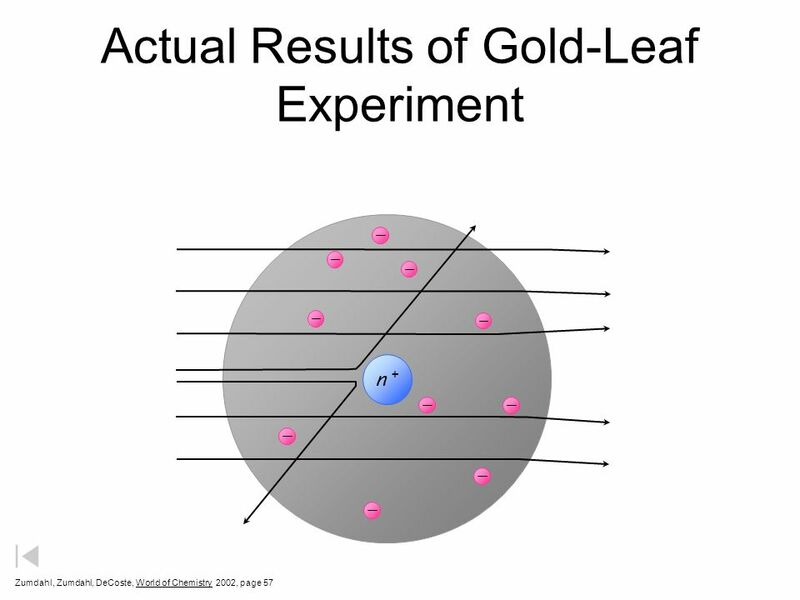 Hard to hit small nucleus (+) will repel (+) When an ion forms: cation…gain protons or lose electrons? anion…lose protons or gain electrons? 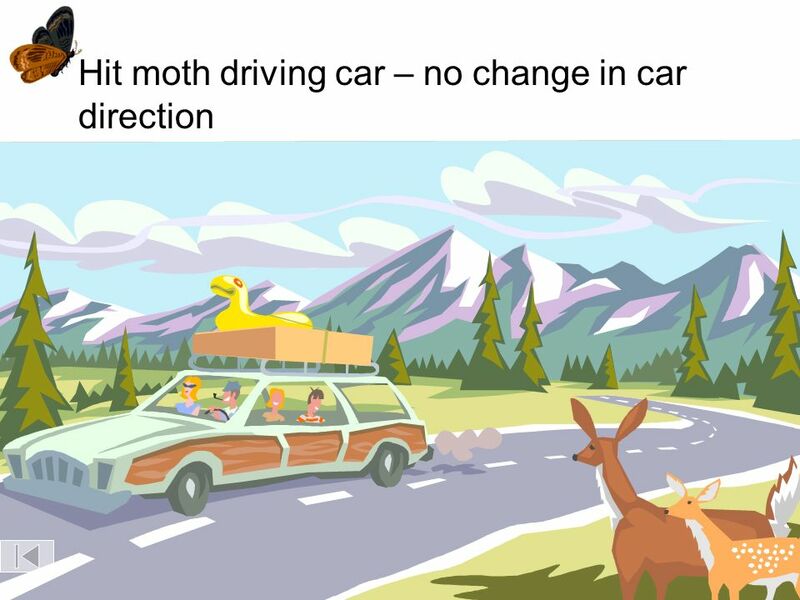 Hit deer – car changes direction Alpha particle moth deer Gold Atom Large angle of deflection, must have hit massive object! 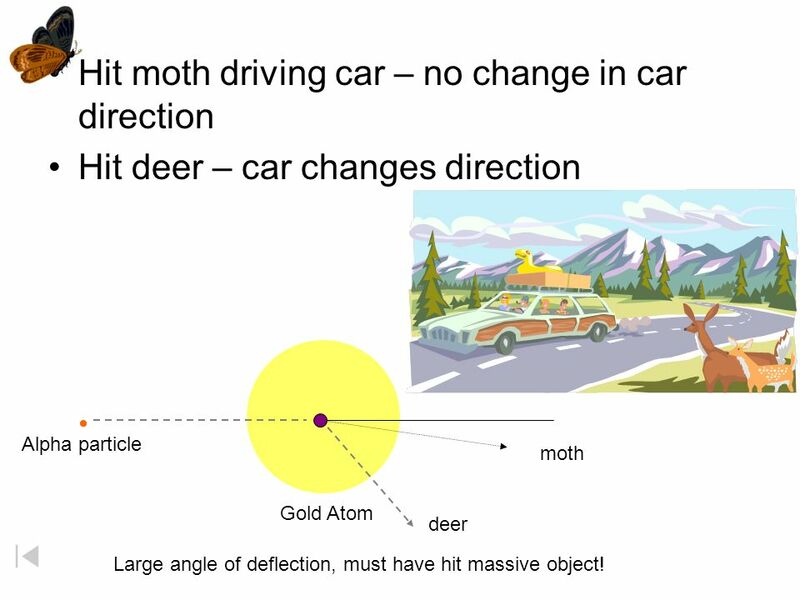 Hit deer – car changes direction Gold Atom Alpha particle moth deer Large angle of deflection, must have hit massive object! 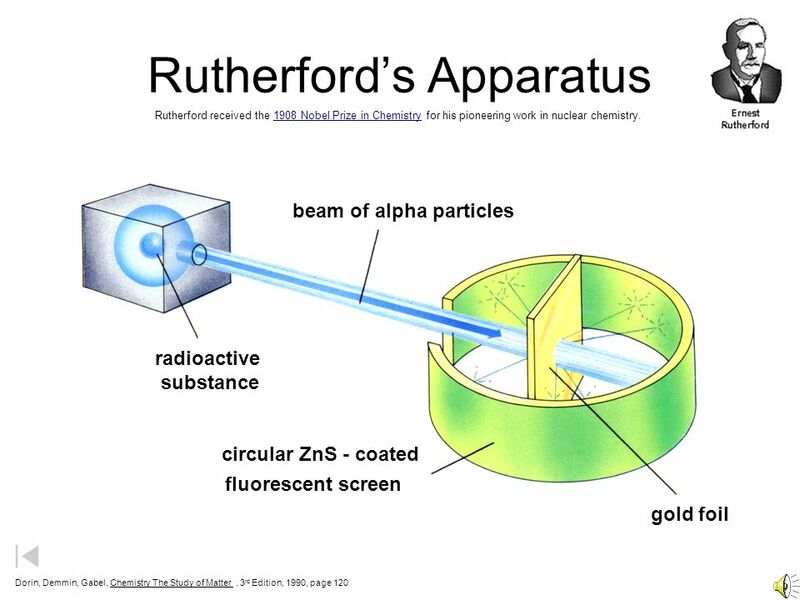 Download ppt "Rutherford Model of the Atom"
An atom is made of a nucleus containing protons and neutrons; electrons move around the nucleus. 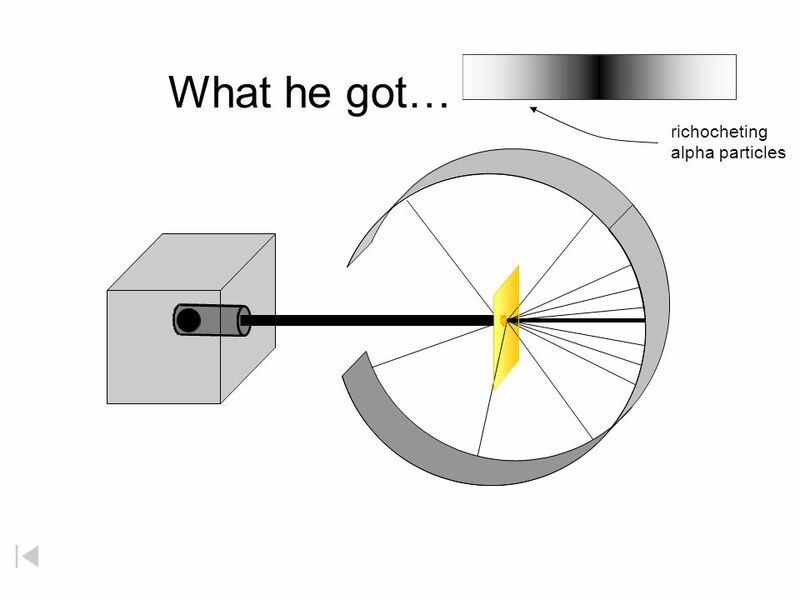 Section 2: Defining the Atom K What I Know W What I Want. DO NOW How do you know what wind is? 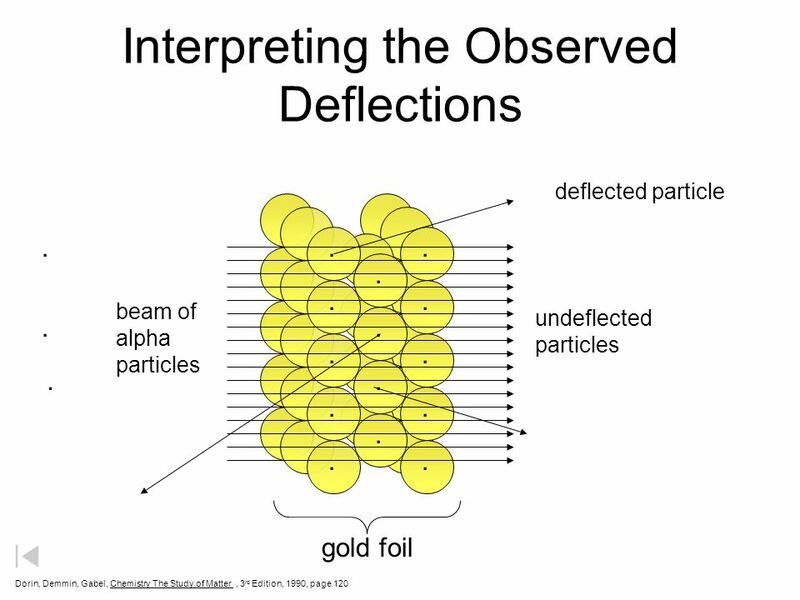 Objective: Describe ancient Greek models of matter and explain how Thomson and Rutherford used data from experiments. 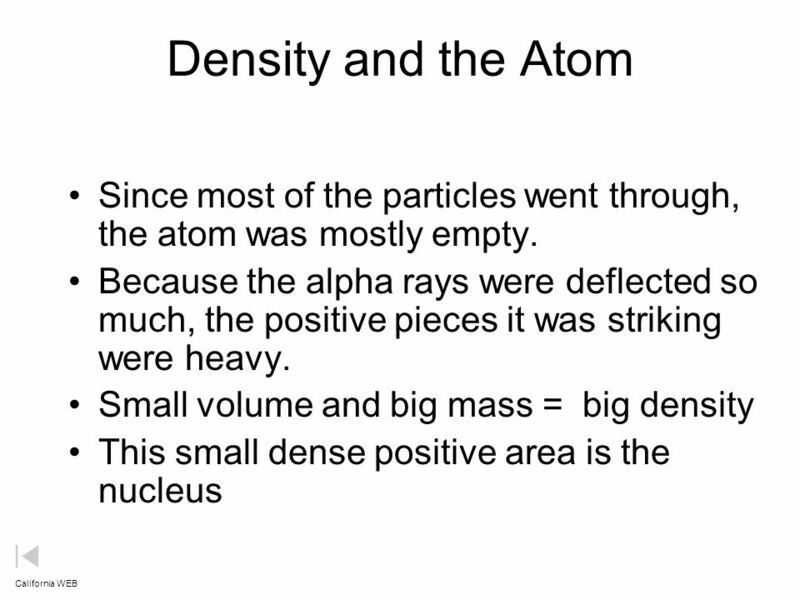 Quantum Theory, Part 1, Day 2 Is There Something Inside of the Atom?!?!? 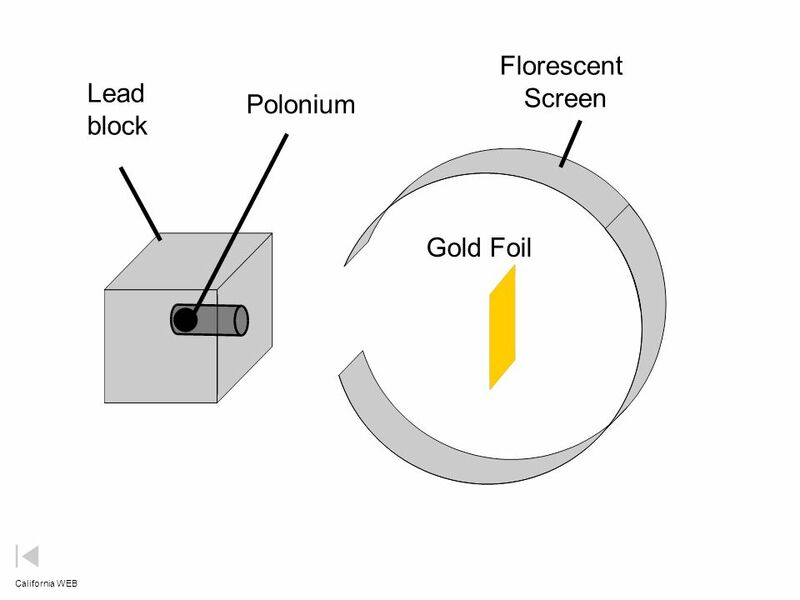 4.2 > 4.2 Structure of the Nuclear Atom > 1 Copyright © Pearson Education, Inc., or its affiliates. All Rights Reserved. Chapter 4 Atomic Structure 4.1. 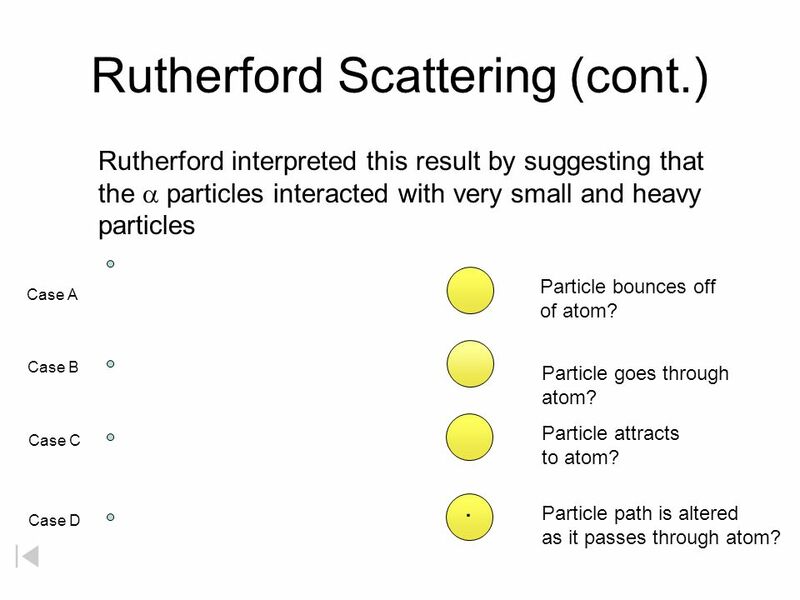 Learning Standards Atomic Structure Broad Concept: Atomic models are used to explain atoms and help us understand the interaction of elements and compounds.